As the Bible says, there is a time for everything under the sun. And my hectic social calendar certainly bears witness to this. Yes, in the life of a busy hostess, there is always time for the exclusively stylish formal affair known as THE CANDLELIGHT SUPPER. And there is just as much time for the carefree and casual dining experience (nonetheless exclusively stylish!) known as THE BARBECUE. Hyacinth Bucket and, by default, her guests, are at home either end of the social spectrum. Because, over the years, my special friends have learnt that whenever the Postman pops one of my engraved invitations through their letter box, they are in for a remarkable social experience regardless of the degree of formality! (Richard agrees.) I am proud to say that whether the occasion is a ‘formal’ one requiring lounge suit and tie or an ‘informal’ one, where one may leave off one’s jacket (unless one is an Onslow and then it’s better if he doesn’t) my guests may always rest assured they will be greeted by a well-laid table and an array of titbits fit for the executive palate. Now you’re reassured, we shall begin our instruction in the art of the Better-Class Barbecue. But so as not to shock, I shall introduce you to the subject gradually, commencing with the several types of progressively more casual sort of Barbecue that take place “indoors” and leading up to the really casual Barbecue, the grand finale: “Casual Dining Alfresco”, which for those of you unschooled in upmarket culinary terms, is a Barbecue that takes place “outdoors”. So. Aprons on? Chef’s hats at the ready? Have you got your outdoor grilling accoutrements laid out in tidy array? All right then. Here we go! Necessity is, as they say, the mother of invention. And in the case of my world famous OUTDOORS-INDOORS LUXURY BARBECUE WITH FINGER BUFFET, I invented it for my Guest of Honour, C. P. Benedict, the Garden Centre King. He’d been on the television times too numerous to count and, as he is an intimate friend of my husband Richard who’d just passed him by in front of the library that very morning, I felt the time had come to introduce ‘Old C.P.’ (as Richard’s so fond of calling him) to our other friends who, of lesser importance though they may be, socially, always know how to appreciate a celebrity guest. It goes without saying that C. P. Benedict is a far better Celebrity Guest of Honour than that boring old Douglas Chater of Chater’s Building Supplies. The Barker-Finches had him at their barbecue and, as Richard pointed out at breakfast while enjoying his EXCLUSIVE EUROPEAN HIGH-FIBRE BREAKFAST CEREAL (See Chapter 2: Breakfast for the Family), the man is absolutely tasteless! Of course that’s only as one would expect, being a Guest of Honour of that awful Sonia Barker Finch. She was a Barker; he was a Finch. And suddenly they’re hyphenated! I cannot bear that sort of social snobbery. People who pretend they’re superior. It makes it so much harder for those of us who really are. Here’s the menu for my OUTDOORS-INDOORS LUXURY BARBECUE WITH FINGER BUFFET. You should arrange it in your dining room with the genuine antique reproduction Queen Anne furniture and a portrait of Sir Winston Churchill overlooking the proceedings from up above the mantel. And don’t forget the plants! Good heavens no – if you’re to have a Garden Centre King as the centrepiece of your BARBECUE, he’ll want surrounding with lots of plants! And be sure and include the candelabra. That goes without saying. First, cook the dark meat, which takes a bit longer. Then you can cook the white meat. This way, it’ll all be done at once (See Chapter Two: Breakfast for the Family, ‘Getting it all done at once’). Combine the buttermilk and ¼ cup salt in a bowl. Transfer to a large, airtight container. Add the chicken pieces, turning to coat in the liquid. Cover, and refrigerate at least 2 hours. Overnight is better! Heat your oven to 200 degrees. Combine the flour, the remaining 5 teaspoons of salt, black and cayenne peppers, and the baking powder. Place this dredging mixture in a large brown paper bag. Shake vigorously. One at a time, place the chicken pieces in the bag, and shake to coat. Place the coated pieces on a clean plate or tray. Heat the vegetable shortening in two 10-inch cast-iron skillets over medium-low heat. Using a frying thermometer to measure the temperature, bring the shortening to 375 degrees; it should be at a medium, not a rolling boil. Use tongs to place thighs and drumsticks in skillets. Fry until the coating is dark golden on the bottom, 10-14 minutes; then, using tongs, turn the chicken over. Cook until the coating is dark golden on the bottom you’ve just turned, another 10-14 minutes. An instant-read thermometer inserted into a thigh should register 170 degrees. Drain the chicken on brown paper bags or several layers of paper toweling. Using a slotted spoon, remove any bits of coating left in skillets and discard. Place breasts and wings in skillets. Cook 10-14 minutes on each side, the same as before. Drain on brown paper bags or layers of paper toweling. Store your fried chicken in matching plastic containers in your refrigerator and chill for several hours. There you have it: COLD FRIED CHICKEN. These are so easy – don’t tell anybody! Spread softened cream cheese on thinly sliced smoked salmon. Wrap this around a small stalk of celery (washed first!). Make several of these and chill them before it’s time to serve them. When you buy your chicken pieces for your COLD FRIED CHICKEN from your quality butcher, have him slip you in the livers. Cook your chicken livers in a large pot of simmering salted water until they are tender and cooked through, about 10 minutes. Drain your livers and cool them. Melt ¼ cup butter in a heavy large skillet over medium-high heat. Add the onion and saute until tender, about 5 minutes. Add the brandy and bring to a boil. Remove from the heat and cool completely. This takes hours in your refrigerator so best to start early! Garnish your pate with lemon slices and Watercress. Serve CHICKEN LIVER PATE with crackers and baguette slices. The involved preparation of this, along with the COLD FRIED CHICKEN, will more than make up for those easy SMOKED SALMON ROLLS. Remove the shells from the shrimp, leaving their tails intact. (Your hubby can be entrusted with this part if you instruct him how to do it properly beforehand. But watch he doesn’t detach the tails! Richard isn’t always as careful as one would wish.) Remove the back veins from the shrimp. Cut down the back of the shrimp with a sharp knife. Gently press the shrimp with your fingers to flatten them. Beat 1 egg, the cornstarch, salt and pepper in a small bowl until blended. Add the shrimp to the egg mixture and toss until the shrimp are completely coated. Remove crusts from the bread. Cut each slice into quarters. Place one shrimp, cut side down, on each bread piece. Gently press the shrimp to adhere to the bread. Brush or rub a small amount of egg mixture over each shrimp. Cut the egg yolk and ham into ½ inch pieces. Finely chop the onion. Place one piece each of egg yolk and ham and a scant ¼ teaspoon chopped onion on each shrimp. Heat oil in a shallow pan over medium-high heat until it reaches 375 degrees. Fry 3 or 4 shrimp-bread pieces at a time in the hot oil until golden, 1-2 minutes on each side. Drain on absorbent paper. fresh parsley, chopped, also for garnish. You can never have too much garnish! Now. Here’s what you do with all of this: Combine the cheese and butter. Stir in the port, yoghurt and mixed nuts. Toast one side of each crumpet. Spread the cheese mixture onto the untoasted side of the crumpets and grill them until the cheese mixture is bubbling. Remove them and garnish each one with walnuts, olives and parsley. These should be served hot so you will either want to make them at the last possible minute, or you will have to re-heat them ever so slightly after your guests arrive. Slice off the tops of the cherry tomatoes and scoop out the pulp (a melon-ball maker works well for this, unless your tomatoes are very small and then you’ll have to use something else -- your imagination! <a little joke>). Combine the cucumber with the remaining ingredients. Mix well. Fill the cherry tomatoes with the cucumber mixture. Special Hint from Hyacinth: Fill a pastry bag fitted with a decorative tip with the cucumber mixture and pipe it into the hollowed-out cherry tomato. Chill these well before serving. Combine the cream cheese and celery. Season to taste with the salt and pepper. Roll the mixture into 1 inch balls and roll these in the chopped parsley. Skewer them with toothpicks and chill well. These are even easier than the SMOKED SALMON ROLLS! 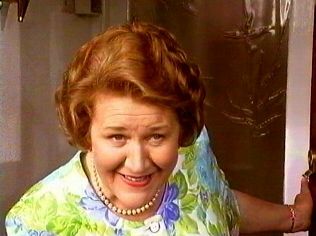 Special Hint from Hyacinth: The fruit for SUMMER PUDDING is typically a mixture of some or all of the following: raspberries, strawberries, stoned cherries, red currants, black currants, gooseberries, and rhubarb. For AUTUMN PUDDING, use a mixture of apples, blackberries, plums and pears. To serve, carefully run a knife round the edge of the pudding to loosen it, then invert the pudding onto a serving dish. Pour the reserved juice over the top. Serve the pudding cold with cream and decorate with fruit and mint sprigs. Now there. You’ve just produced what will arguably be the highlight of the municipal year in your little town – at least it will be amongst upscale Garden Centre Circles: THE EXCLUSIVE OUTDOORS-INDOORS LUXURY BARBECUE WITH FINGER BUFFET. The Well-Planned Country Cottage Affair Once you’ve treated your special friends to an EXCLUSIVE OUTDOORS-INDOORS LUXURY BARBECUE WITH FINGER BUFFET (and Celebrity Guest of Honour!) you will not be able to top it. So it’s no good your trying to do so. However, if, like myself, you’ve got a wealthy sister (Violet: large house, sauna, room for a pony) then the next best thing is to borrow her country cottage at the weekend and invite your guests there for THE WELL-PLANNED COUNTRY COTTAGE AFFAIR, i.e. a BARBECUE. Richard and I accomplished it all with only a modicum of fanfare, as is our wont, not too long ago – that is, we would have done had not our neighbours turned out en masse to bid us adieu. What a lovely sendoff they gave us. As I told Richard, ‘We must never move, dear. The neighbours would miss us so!’ I shall relate The Buckets’ experience of organising THE WELL-PLANNED COUNTRY COTTAGE AFFAIR and then you can let that be your guide. But first: a tiny word of advice about TIMING, if I may. I am, as anyone who knows me will testify, a caring daughter. And as busy as I am with my myriad of charitable duties, my father’s welfare is paramount. I worry about Daddy constantly. Well I worry about all the family, but I worry most of all about Daddy, who lives with my sister Daisy and her unfortunate husband Onslow (see page 7 of this book for what not to do in the presence of expensive wallpaper). Anyway, back to TIMING: Neither Daisy nor Onslow gives any consideration to Daddy’s appetite, at least in terms of his craving for haute cuisine cookery, so I always make it a point to include that noble old man in the festivities at The Buckets whenever the occasion warrants it, normally once a year on Daddy’s birthday (See Chapter Seven: The Ordinary Family Supper) and at any other social entertainment where it is safe to include a Daddy. Warning: This is where the all-important consideration of TIMING becomes a factor to the success of your social entertainments. Because if you’re going to invite your special friends to THE WELL-PLANNED COUNTRY COTTAGE AFFAIR you’ll want to ensure they arrive after your father (and his escorts) have left. Daddy tends to become overwrought in the presence of important guests. So invite your father for a Teatime Barbecue and then he and whoever drives him will be long gone before your other guests arrive. As far as your accoutrements, it goes without saying you’ll want to take a few of your objets d’art as well as your very own quality crystal glassware, particularly if you’ve a brother-in-law like Bruce who favours glasses engraved with naked ladies. Bruce does have such an odd sense of humour. But he is a Rotarian so I’m sure he can be forgiven his little quirks of personality. THE WELL-PLANNED COUNTRY COTTAGE AFFAIR is ideal for musical entertainment! At Bruce and Violet’s cottage, Richard and I love cranking up the victrola for a little sedate glide round the room after the cocktail hour and before the BARBECUE itself commences. If you’re lucky, you’ll have a Manor House nearby and a couple like our dear friends Bunty and Dorian dropping by for a quick tango and a conga before dinner. And if music is not enough to amuse your special guests (hard to imagine, I know – but it sometimes occurs that one of them suffers from a tin ear) do like I do and have your albums of Sheridan’s holiday snaps handy to delight one and all! Combine all the ingredients (except for the olives) in a cocktail shaker and shake with rapid little movements and a quick flick of the wrist in a ladylike manner). Strain into a well-chilled cocktail glass and garnish with an olive on a pick. These are really wonderful! Bunty and I liked them very much. I’m afraid we so enjoyed the dancing we never got round to dinner. But that’s all right. There’ll be other times. Richard said the prospect was blinding. My husband has his little annoying habits and faults but one thing I’ll say for Richard: He never fails to see my point of view. You can have anything you like for a MERRY ENGLAND BARBECUE. But just be sure and include my FLAKY PRUNE SURPRISE (!) one-bite canapes for Cowherds and Shepherds. (See Chapter Four: Lunch). No need to adapt the recipe you used for your Pre-Luncheon Canapes and Cocktail Hour in order to make it suitable for Cowherds and Shepherds. They won’t know the difference anyway. And no need to limit them to three of your FLAKY PRUNE SURPRISE (!) one-bite canapes either. Country folk have iron- clad constitutions. Richard? Are you awake, dear? Time for tea! Yes, it’s all right. I think we need a little break – we’ve got lots to do ahead of us yet this afternoon. Go along out into the kitchen now and make us a nice cup of Earl Grey, won’t you. Richard thinks I don’t know he’s been dozing off through the last two and a half chapters. But it’s just as well. He only distracts me from the task at hand anyway. Men can be impossible sometimes. But they’re good for putting the kettle on. Oooops! Back already, dear? Oh how nice. You’ve brought us each a little mince pie with our tea. No, not now, Richard. I couldn’t enjoy a glass of sherry, not when I’m mentally attuned to CASUAL DINING ALFRESCO! Good heavens. Whatever next. I invented my BON VIVANT BUFFET WITH ALFRESCO MUNCHIETTES for my sister Violet’s benefit. She’s so at loose ends, poor girl. My brother-in-law Bruce buys her everything! She has a large house, a sauna, a musical bidet (it plays only classical of course) and room for a pony. What more could any girl want than this? I’m afraid I spoilt her when she was growing up. But like my sister Daisy, Violet has too much time on her hands (albeit for very different reasons!) At least Violet has something to polish, which is more than can be said for Daisy. Anyway, I decided what Violet really needs is a little social entertaining inserted into her otherwise unimaginative lifestyle. So I invited a few of my select friends over to Violet’s for a casual outdoor dining experience for which I developed a menu that is, in its own simple way, an elegant gastronomic delight. Brace yourselves, my dear Readers! No, Richard, not you! You’ve been through it before, dear. And take your feet off my table. And don’t forget the Sweet! And last but not least, the Savoury. Angels on Horseback Now do you see why we took that little tea break? We’ll have the sherry “after”, Richard. Whilst you’re cooking you may wish to have your hubby put some recordings on so you have music while you work. And then you’ll have some well-memorised selections for your musical entertainments. My special guests so enjoy my own unique “Sing for your Supper”, a speciality of mine, based on a party game originally conceived by King Henry VIII. And now we’ve got our music playing, our aprons on, our oven alight and our faces all aglow, let us commence producing THE BON VIVANT BUFFET WITH ALFRESCO MUNCHIETTES! Remove it from the tin and serve it in a cut glass dish on a bed of ice with toast points encircled round and perhaps a tiny bit of hard-cooked egg atop each. In a saucepan, cover the eggs with cold water and bring the water just to a boil. Simmer the eggs for 5 minutes. Pour out the water, add cold water to the pan, and let the eggs cool until they can be handled. Shell the eggs carefully and halve them lengthwise. Spoon a small dollop of the olive paste onto each egg half, top the olive paste with a caper, and arrange the egg halves on a platter lined with the thyme branches. Garnish the egg halves with the thyme sprigs. Preheat your oven to 350 degrees. In a baking pan, spread the sesame seeds evenly and toast them, stirring once halfway through the toasting process, until they are deep golden, about 12 minutes. Cool the seeds and in a food processor (you’ve got one by now I hope!) pulse them with the salt until the seeds are coarsely ground. You have just made “sesame salt”. In a saucepan, boil the quail’s eggs as you did for the QUAIL’S EGGS WITH OLIVE PASTE. Only once you’ve got your eggs boiled, all you do is peel them and serve them with the sesame salt. Roll out the puff pastry (You’ve bought this and keep it on hand for occasions such as this, remember?) until 1/8 inch thick. Wrap the seasoned salmon in the pastry and glaze it with the beaten egg. Bake for 20 minutes at 375 degrees. Place the cherries in a pan; add the sugar and vinegar. Bring to the boil and then thicken slightly with the cornstarch. When the salmon is ready, add the kirsch to the berries. Serve the salmon onto a warmed platter and serve the cherry sauce on the side in a little boat. Saute the onion and mushroom stems in the bacon drippings until tender. Drain off the excess fat. Mix the crumbled bacon, onion and stems with the softened cream cheese until the mixture is workable. Stuff each mushroom with the cream cheese mixture and bake at 350 degrees for 10-15 minutes. Finish under the broiler just until the tops are golden. Mix the cheese, raisins, nuts, celery, grapes, KIWI FRUIT, and strawberries together in a bowl. Mix the sour cream, lemon juice and Worcestershire sauce together in another bowl. Pour the sour cream mixture over the cheese mixture and toss gently to coat. Serve WENSLEYDALE FRUIT SALAD on a bed of chicory leaves. It goes without saying you won’t want to invite Lydia Hawksworth to partake of your WENSLEYDALE FRUIT SALAD. In fact, she shouldn’t even be in your guest book! Now. Have you all your comestibles assembled and ready? All right then. Here we go! Pre-heat your oven to 400 degrees. Weigh your duckling. Prick the skin of your duckling all over with a sharp fork. Place it breast-side down on a rack in a roasting tin. Roast your duckling in the top of the oven, basting occasionally, for 20 minutes per pound. Weigh your chicken. Place your chicken in a shallow roasting tin and roast below your duckling on the lowest shelf of your oven for 20 minutes per pound plus an extra 20 minutes beyond that. Cool both your duckling and your chicken for 1-2 hours until cool enough to handle. Make a slit along each side of the breast bone of both your duckling and your chicken. Remove and discard the skin. Carefully remove all the flesh from the carcasses and cut the flesh of the birds into thin strips about 2 inches long. Cook the carrots in boiling water for 8 minutes until just tender. Drain and rinse them in cold water. Cook the potatoes in boiling water for 15 minutes until tender. Drain and leave them to cool, then dice them finely. Make the dressing by whisking the oil, lemon juice, mustard and sugar together. Choose a large oval platter for making up the salmagundi: Place the potatoes and peas in the bottom of the dish to give a flat base. Arrange the carrot strips with a layer of cucumber on top, following the oval shape of the platter. (Your platter should be an oval one.) Pour over this a little of the dressing. Next, arrange another layer of carrot and cucumber slightly inside the first layer so that the first layer may be easily seen (Think of a picture frame). Top all this with more layers of chicken, peas, tomato slices, celery, and duckling. Make each layer smaller than the previous layer so that the lowest layers can all be seen. Sprinkle each layer with dressing. Continue layering until all the ingredients are used up. Now shell and halve the eggs, top each half with a little mayonnaise. Garnish with a few radish slices and stuffed olives, and arrange them around the edge of the dish. I always have such fun making Salmagundi! So I hope you’ve enjoyed it too. Now here’s where you husband will come in handy, if you’ve got one. Men always look so well with chef’s hat and apron on, spatula in hand and poised over the grill. Have your hubby prepare the charcoal grill and heat it to its hottest whilst you brush the chops, kidney halves, and steaks with melted butter and season with salt and pepper. (Men are good at grilling but they don’t know the first thing about proper seasoning). When all the meats are done (Check them yourself and be certain) have your husband remove them to a very hot plate where he will keep them warm until they’re required. Brush the tomatoes and mushrooms with melted butter and have your hubby grill them for about 5 minutes. Then you can arrange the whole thing on the hot plate and garnish with Watercress! Be sure he turns the chicken occasionally whist it’s grilling and he should brush it generously with sauce. If your husband’s like my Richard, you may trust he’ll be generous with the sauce. This is one thing you won’t have to check up after him. Mix the ground beef, onion, water, salt and pepper. Shape the mixture into patties, each about ¾ inch thick. Have your hubby grill them 5-7 minutes on each side for medium whilst you prepare the MUSHROOMS AND ONIONS. Cook the onion in the butter over medium heat, stirring occasionally, until tender. Stir in the mushrooms and Worcestershire sauce; heat until the mushrooms are hot. When the burgers are done, spoon the MUSHROOMS AND ONIONS over. Isn’t this fun – cooking together with your husband? Richard and I love it! The grill will still be hot – but don’t let it get too hot! And be very careful where you place your signs for your musical entertainments!! Combine the food ingredients in a large mixing bowl and mix well. Then he can grill your SPECIAL BURGERS to the desired state: rare for Onslow – the man has absolutely no patience when it comes to waiting for haute cuisine cookery to reach a state of perfection; and ‘well done’ for The Major, as he will be the first to tell you when he sees them – just watch his eyes light up at your approach! You should pop these SPECIAL BURGERS between the halves of a sesame seed bun with plenty of lettuce, tomatoes, onions, and pickles on. This is my sister Rose’s absolutely all-time favourite dish, after fried bread. (We had that at breakfast, remember? See Chapter Two: Breakfast for the Family). She thinks GRILLED BRATWURST on hard rolls reminds her of Mr Helliwell for some reason. I make this for Rose, exclusively. She is my sister and I love her dearly. Once a year on her birthday. Onslow likes GRILLED BRATWURST too, but I doubt it’s for the meat! In a large pot, combine all the ingredients – except the hard rolls! Simmer for 20 minutes. Your hubby’s kept the grill hot in your absence, one hopes. So now you remove the bratwursts from the pot and place them on the grill where hubby can keep watch for about 10 minutes, turning them occasionally. He should grill these until they are brown. Tell him to sprinkle them with water and they will form a crispy skin. Once you’ve put them into their hard rolls, you may top with a little of your (or Rose’s) favourite mustard. If you have her at your BARBECUE, you’ll have to ask her what her favourite mustard is as it changes from week to week. Rose is fickle. I’m sure it’s hormones, poor girl. This is the only vegetable you’ll want to come between your hubby and the grill. Now the grilling’s over and done with you can relax a little bit and go back to your normal food preparation to round out the menu for your BON VIVANT BUFFET WITH AL FRESCO MUNCHIETTES. Chop the cabbage finely. Mix the other ingredients in a large bowl. Add the cabbage and toss. That’s all there is to it! Isn’t this a welcome rest from all that grilling? Mash the egg yolks, cayenne pepper and sugar to a paste with the anchovy essence, vinegar and 1 teaspoon of the cold water. Stir in the cream. When the potatoes are cooked, drain them thoroughly and toss with the dressing. Serve warm or cold, garnished with the snipped chives. First, make the pastry: Sift the flour and baking powder into a bowl, then rub the butter into the flour. Mix in enough water (about 3 Tablespoons) to make a stiff dough. Roll out the pastry and use it to line an 8 inch flan tin. Boil or steam the potatoes until tender. Chop the onions, then fry them gently in the oil until very soft. Combine the potatoes with the onions. Add the butter, parsley, half of the cheese, and the milk. Mix and season well to taste. Let the mixture cool, then use it to fill the flan tin. Sprinkle with the remaining cheese. Bake in your oven at 425 degrees for 20 minutes. My sister Daisy begs me to make HOMITY PIE for her and so I do it every chance I can. She is family and I know my duty, even if I did spoil her growing up by serving HOMITY PIE at too many family suppers. I hope you’ve saved room for the Sweet! 3 Tablespoons sour cream – or if you’ve got a nervous neighbour like Elizabeth on your guest list, you may like substituting yoghurt as it calms her down and saves your fine china. Serve DAMSON AND APPLE TANSY immediately, straight from the pan, with sour cream – or, as instructed above, with yoghurt. In a large bowl, stir together the lard, butter, 1 cup of the sugar, the egg, and the vanilla. Into the bowl, sift together the flour, the baking soda, and the salt, and stir the mixture until it forms a dough. Chill the dough, covered, for at least 2 hours or overnight. Preheat your oven to 375 degrees. Roll rounded Tablespoons of the dough into balls; roll the balls in the additional sugar, coating them completely, and arrange them 3 inches apart on lightly greased baking tins. Flatten the balls with the bottom of a glass dipped in the sugar (the edges will crack slightly but that’s all right – that’s how they are) and bake the biscuits in batches in the middle of your oven for 8-12 minutes, or until they are pale golden. Transfer the biscuits to racks and let them cool. The biscuits will keep in an airtight container for one week – IF you can keep your family from stealing them away when you aren’t looking! And last but not least – The Savoury. A tiny word of warning: I stopped serving these once I had Sheridan as I told Richard, ‘I will not raise Sheridan in a Continental atmosphere.’ Richard agreed, of course, as any responsible husband and father would. ANGELS ON HORSEBACK aren’t really Continental. They’re more religious, actually; however, I found that any time I served ANGELS ON HORSEBACK, they seemed to cause a return of French habits to The Bucket Residence. So. Forewarned is forearmed. These are only to be served for the most special of special of occasions. Still, they are quite safe for my BON VIVANT BUFFET WITH ALFRESCO MUNCHIETTES as I always invite the Vicar. Sit him down at the table with a cup of tea and a plate of your OLD-FASHIONED SUGARED BISCUITS. The combination tends to have a calming influence. There you are. You have come from the most elegant of indoor BARBECUES through each progressive type of outdoor-indoor, town and country type BARBECUE to the ultimate, the -- as they say -- Mother of all BARBECUES! HYACINTH BUCKET’S BON VIVANT BUFFET WITH ALFRESCO MUNCHIETTES. Be proud, Dears. With a BARBECUE like this, you will – as I am -- be the talk of the town! Now, read on – if you dare – and we shall take what, in less capable hands, would ordinarly be a very primitive meal, “The Picnic” to the absolute heights of respectability! Turn the page for Chapter Nine: PICNICS.